Who doesn’t like a good thrift find? Goodwill’s blue Boutique is brand new to Downtown Akron, opening just a few months ago in August, an d is full of great finds at affordable prices. I stopped into the store to sit down and talk with Janet Morrison, Vice President of Contacts and Logistics and Dee Gillespie, Manager of blue Boutiques. This lovely little boutique came straight from the minds of Akron students who missed having a Goodwill downtown. When the store closed in 2000, the students were given a project to bring Goodwill back. The final projects were presented to the student’s instructors and Goodwill and that’s how blue was born. It took years o f working with the idea to find great success before blue found the perfect location right on S. Main. But all the effort put into the project is evident as soon as you walk into the store. The urban feel makes it fit right into downtown and it’s easy to find exactly what you’re looking for. You’re not going to be wearing what everyone else is; you’re going to find a “different look that’s not coming off the rack…very rare and very unique,” said Morrison. Morrison also mentions that “blue is a great opportunity to reach those that don’t typically thrift,” or find larger thrift stores to be overwhelming. Gillespie, who comes from a family of Goodwill shoppers, says it helps break the stigma that only people of need shop at Goodwill. But the smaller size doesn’t limit your options by any means. You can still stop in and find shoes, purses, cute tops, lots of denim, and there’s even clothing for men. Thrifting isn’t only great for your wallet, but it’s a great way to help others. Goodwill’s mission is to help people find and retain employment. Morrison wants people to know that every dollar that is spent at Goodwill is helping their mission. Goodwill wants to help others and they want to provide a place for everyone to shop, regardless of income. Goodwill is also part of the recycling movement, and that’s why Morrison and Gillespie believe that blue has been so successful. Morrison says millennials today have connected with the sustainability movement and want to reduce waste. So when you shop at blue you’re truly supporting so many good causes. And it’s also a great place to stop in and volunteer. Morrison and Gillespie’s goal with blue is to strengthen the community and bring retail to downtown to help create employment and give back. If you’re looking for unique finds and great prices stop into blue boutique at either location (Akron or Kent), and for more information check out their website. 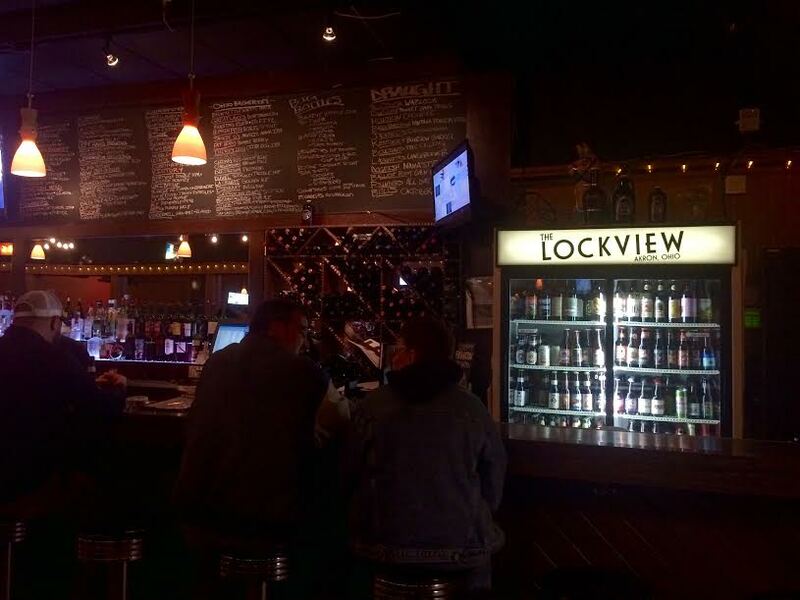 All throughout my college years thus far, one of my favorite weekend hangouts has always been The Lockview. There’s something about the relaxed and somewhat indie atmosphere that has always made for an enjoyable time and fits in seamlessly with the creative Downtown Akron vibe. I had the pleasure of sitting down with the owner, Danny Basone this week. We spoke of the past, present, and future of this Main Street treasure. If we begin with the past, we would be referring not to The Lockview, but to a concert venue called Lime Spider. 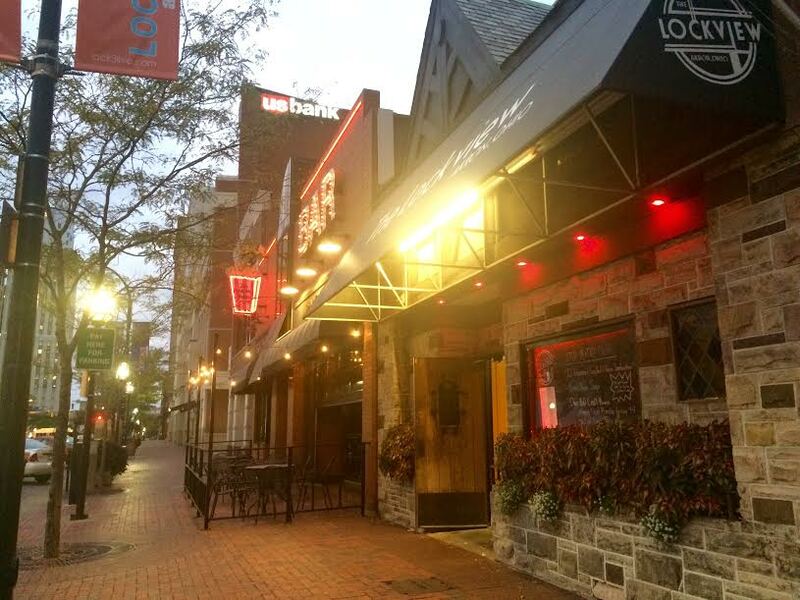 Before The Lockview was born, Basone opened this place in 2001 that has the bragging rights of being the venue of one of The Black Keys‘ first shows. A musician himself, Basone brought in any musical artist who wanted to play a show and also helped with the sound engineering. Unfortunately, the music scene in Akron just wasn’t giving enough business to the venue and Basone made the tough decision to close Lime Spider in 2008 and was forced to put use to his creative mind to rescue his place. “As a business owner, you don’t want to walk away from a space. I’m going to make this work,” he told me. And he sure did. So he repainted, redesigned, and re-birthed this space that was to become The Lockview. When brainstorming new ideas for the space, Basone thought of one of his friends who participated in grilled cheese competitions. This friend helped him build the grilled cheese menu that Basone’s customers enjoy today. He wanted a menu that was simple and kept people coming back. As another rock to building this business, Basone’s family has always been a core support. His brothers and sister have helped him tremendously along the way, from being the restaurant’s food buyer to being day managers. When asked about thoughts of expanding outside of Akron, it’s definitely a thought but nothing is in the progress at the moment. He has considered the Cleveland area, but it remains an idea that will come to fruition when the time is right. Presently, Basone has his hands full with his latest project, taking place in the neighboring space to the right of The Lockview. This new project is called El Gato Tacqueria. Formerly Hattie’s Cafe, this is something that will be very unique to Downtown Akron in the sense of it being a street taco type of place. El Gato will be a small restaurant, seating about 35 people and will offer quick service. It will have an eight item menu serving tacos, burritos, and salads, with vegetarian options as well. As far as drinks, it will serve beer and soda. El Gato is expected to open sometime this fall, with no concrete date set. As a supporter of the arts, Basone will also bring in works from local artists to display in El Gato as he already does in the Lockview. Basone has always been a supporter of the arts and is proud to continue to give a place where artists can show their work. Recently, Akron has become a city that has allowed artists to express themselves more frequently, thanks to local business owners like Basone, and the rise of public art spaces such as the Summit Artspace and Ro3. After hearing all that he had to say, I can tell that Basone is a practical and laid back sort of person that Akron should be proud to have raised. He says, “I’m also giving to the community in the sense that I am hiring people… There’s something cool about that.” Danny has definitely done his part to contribute to the city of Akron through his creative mind and optimistic spirit, and I for one cannot wait to see what new projects he will have in store for the future.